Moving to the other side of the planet was traumatic at first, but has been increasingly wonderful since. Still, I’m not so far away from the day I left Los Angeles for Morioka that I’ve forgotten the stress of arriving in a country in which I don’t speak the language (vividly). The only thing that really freaked me out before I left was the logistics: I knew I could take a bus from Narita airport (NAR) to Tokyo, but where could I buy a ticket for that? I knew I had to spend one night in a hotel Tokyo as soon as I arrived, but how should I go about finding one, then finding the station in the morning without internet access? My phone didn’t work in Japan, and cafes (including Starbucks) don’t just let anyone log onto their wifi. I couldn’t book one beforehand because I wasn’t sure which station I’d be leaving from to get to Morioka the next day (spoiler alert: You can catch a train from NAR to the main Tokyo station). These issues were solved with a mixture of keeping my eyes open, generous locals, and dumb luck. Still, it would’ve been nice to have a more complete picture of what I was setting myself up for, so here’s a play-by-play of how to navigate the Shinkansen (bullet train) once you arrive in Japan. -You’ll be given a customs form to fill out on the plane, and you might have to fill out another form when you arrive at the customs area. Any form you need to fill out can be found there in English. Customs moves more quickly in Japan than in any other of the 15 countries whose airport customs I’ve experienced. –Baggage claim is impossible to miss and idiot-proof. -Keep your passport and any forms from customs at the ready after you pick up your bags. They’ll be checked just once more before you leave the baggage claim area, and then you’re free to roam Japan! -Follow signs to the train station connected to NAR (downstairs), and find a JR ticket booth (bright green!). Buy a Narita Express (NEX) ticket, and while you’re at it, buy a Shinkansen ticket (more about that below). Cost is around $40. -If you’re not a fan of trains, you can buy a bus ticket right across from the currency exchange booth in the lobby for about $9 (a thousand yen). It takes about twice as long, but I slept through half of it when I arrived. –If you take the bus, just step outside from the lobby and go right along the building until you hit the bus stop (which is all the way at the end). Feel free to ask random locals for help! Just show them your ticket and say “Toko?” (“Where?”). –If you take the NEX, go downstairs to the train station and follow the signs for NEX. Electronic boards with lists of trains are organized by departure time all over the station, and you can find out which platform to go to there. -You’ll have to buy a Shinkansen ticket at a travel agency if you want to book before you leave for Japan. You can also buy it when you arrive at any JR ticket booth. Buying them online is not an option. -Buy a Shinkansen reserved, non-smoking ticket. That way you’re guaranteed not to stand for the ride, and won’t smell like a chimney when you arrive. -There are usually two seats on either side of the aisle, but sometimes there are three, so make sure you get a window. You can catch a glimpse of Mt. Fuji if you sit on the left side of the train while travelling north, and the view of Japanese small towns, farmland, forests and mountains is impossibly beautiful outside the cities. Stay awake and enjoy the view! –First class is not that much better. The normal, non-first class seats have loads of leg room and are perfectly comfortable, so I would strongly recommend against upgrading. I got kicked out of first class. Take it from someone who knows. 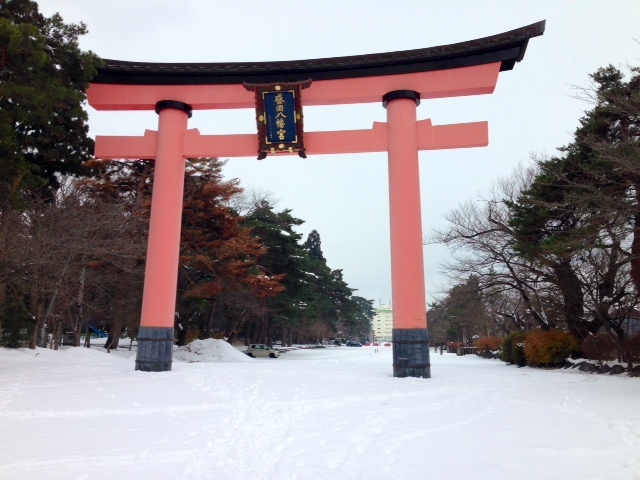 -Also buy a NEX ticket (the train from the station to Tokyo). It’s about a one hour ride from Narita airport to the Tokyo main train station, which is huge and very confusing, but most ticket sellers can speak a little English, so if you get lost, just line up and hope you find an English-speaker. Good luck! –If you stay in Tokyo for the night, any hotel you stay at should provide wifi, and the most hilariously tiny living space you may ever pay that much for. I paid about $100 for one night in the smallest room I’ve ever folded myself into. It would’ve made a disappointing walk-in closet. Still the toilet was fancy, and the shower was a comfortable size for a 5’8″ person. –Do not pass through any automatic gates that require a ticket unless you know for sure that’s the correct place to go. There’s a chance the machine will just eat your ticket, and not open anyway. This has never happened to me because I am perfect. -Each Shinkansen car is very long, and each has its own spot where people line up to board, indicated with markings on the ground. When confused, follow the herd. -There are signs showing the number of each train car above where they will stop at the station. 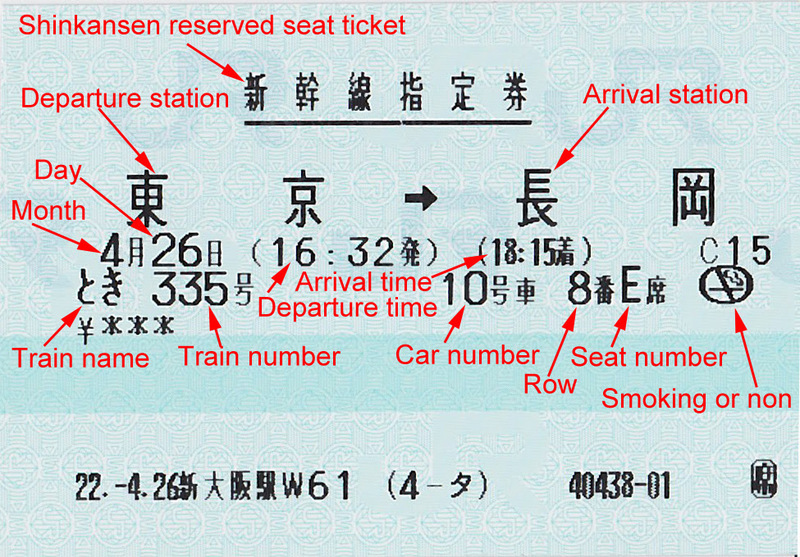 You can see all the info you need on your Shinkansen ticket. –Pack light so you can navigate the inevitable crowds more easily. Lugging my bags around Tokyo station was inconvenient, and felt impolite. -There are restaurants at every station, and often they are quite good, so don’t shy away from having a meal there, as many 9-5ers do here in Japan. -Each row of seats has two outlets for charging phones, etc., on the floor next to the window seat. There are no three-prong outlets in Japan, only two-prong. -Each seat has its own fold-town tray table, and fold-down cup holder. So convenient! -Someone will come down the aisle with a cart of food and drink for purchase. Prices are very reasonable, and the food is good quality bento and random snacks. They can move pretty fast sometimes, so keep an eye out, and just call out a polite “Sumimasen!” as they pass you buy. -There is a space between each car to store large luggage. There is a combination lock provided, attached to a metal rope, so you can loop it through a handle on your bags and lock it up for the duration of the trip. -There is also an overhead storage area that is simply a shelf. -Bathrooms are located between cars. You can stand up and walk around anytime, and in fact, many people take the chance during the smooth ride to go to the empty space between cars to their daily stretches. I slept. –Stops are announced in Japanese, then in English, well before arrival. Be sure to leave enough time to forget the combination you used to lock up you luggage a couple of times before the panic sets in. –Keep your ticket. You’ll need it to pass through one last gate to exit your destination station, regardless of where you’re going. -Every station has a series of lockers you can rent for a few hundred yen and stash your luggage while you check out the city. Make sure you exit the Shinkansen area before you lock up your stuff so you don’t have to pass through a gate that requires a ticket to access your stuff midway through the day. I have never made this mistake because I am perfect. -Be ready to line up to get a taxi. The Japanese make lines for everything from giving offerings at a shrine, to getting on the bus, which is fantastic. It eliminates any sense of competition, and gives people a sense of fair treatment. If you think you’ll have trouble remembering where you stored your luggage at the station, or what your hotel looks like, take a photo! I sort reminder photos in a separate album on my phone so they’re easy to find.